sock prØn. : of grasshoppers and ice cream. of grasshoppers and ice cream. My walkaround socks are finally done :) This pair started as my free-hands knitting about town, a few rounds here and there waiting at the post office, the farmer's market, the pharmacy... After I finished the first somewhere in the haze of holiday knitting, I decided to step them up and finish them as a gift... til I ran into the problems with the second skein and had to use US 0's for the second sock to match the gauge I had with US 1's on the first. Now, this is my 6th skein of Tiny Toes (2 pair of boyfriend socks down)... but I hate to say that turtlegirl76 had the same problem with one of her tiny skeins. Its a bummer since I really like the depth of their solids... I think the variegateds are okay but on a little of the dark/contrasty side for me (my tastes have been all over the place lately). I think this is one of those elusive "great guy" colorways, though. Priscilla Gibson-Roberts' method of heel and toe, and a baby cable rib cuff. My first FO of the new year wasn't a pair of socks, though. I've been a bit taken with pearls lately... and believe strongly in the power of red accessories (i don't know how to accessorize, so i do it on an obnoxious scale in red when i try), so this was bound to happen. Bound. I bought a strand of seed pearls (tiny tiny!) that were just too small to use with my stitch markers, but I hated see go to waste. I found a very fine gauge red wire (finer than 26 gauge, which didn't work for these... i misplaced the sticker and forget the actual details) and strung them onto the wire. Then I just sort of winged it, starting with a few i-cord rounds (hah! no such thing when its 1 st deep in wire!) and increasing on up... pushing pearls randomly onto the wire, and using a very simple lace pattern to keep it open looking. Its a bit wide, but honestly I really, really like it; echoes mermaid fishing nets. It also used relatively few pearls-- I have enough to make at least one more, maybe 2. 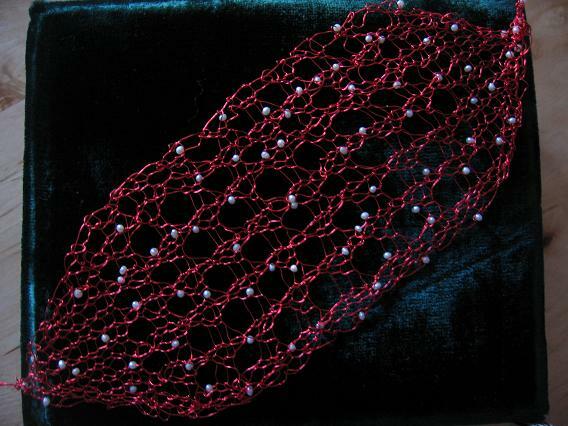 I think I will play around with the wire though, different things than just a flat cuff... there's a dimensionality to knitting with wire that's really exciting. maybe its good i keep trying, or wanting to try. Baby cable rib is my favorite! I've done umpteen socks with it. My local grocers now carries that brand of boutique soda's. The creme soda is great. Their orange soda is next. 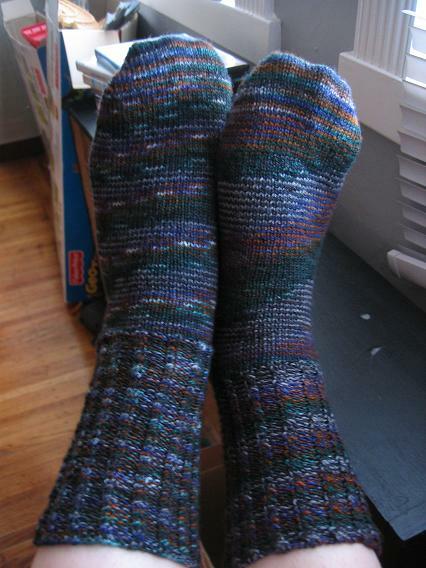 that stinks about the socks - weird...but, they do look great now that they are done! the wire bracelet is so pretty! I love the baby cable rib! Also, the bracelet is perfect! That's just how a mermaid would make her own jewelry. Very pretty! 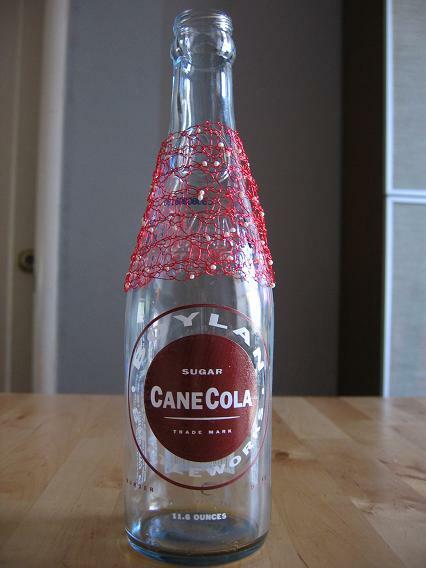 Would make nice wraps around a glass tea candle holder also. Very nice socks. Toe up, too! I have a mental block about toe-up. Cool bracelet, too. The socks look great, no one would ever know they were knitted on different size needles! Love the bracelet too, it's perfect. Ooooohhhh....I like the bracelet! I've been trying to describe to Emily the kind of bracelets I want for the wedding, and I want something like this! Fantastic! The socks are so nice! They look well worth all that yarn trouble! Of course you turn out a great pair of socks - that goes without saying (the mirrored baby cables are a decidedly good touch.) I LOVE the bracelet! I don't think it's a bad thing at all for it to be big or red! That wire bracelet is beautiful! Love the socks, the baby cable rib is really cool. I have been so trying to avoid knitting with wire and beads and your bracelet has sapped all my willpower. Now I've got to go buy some wire to go with all these beads. Help! I love the socks, and the bracelet is so pretty and delicate. Pearls are wonderful to work with. I haven't tried knitting with wire before,but those photos make me want to try. The bracelet looks great. 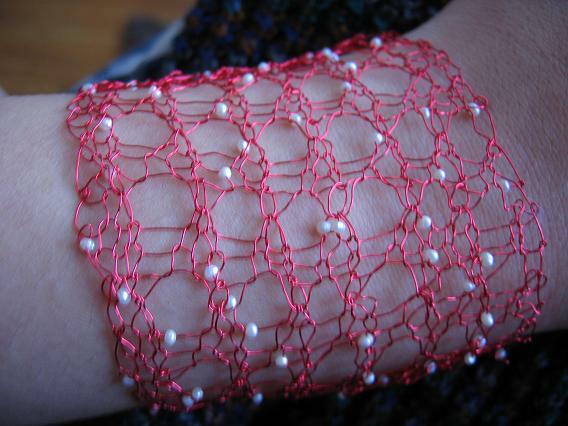 Lovely bracelet - the pearls with red wire is a great combo. That bracelet is so pretty! I love the look of knitted wire. Once I figured out baby cable, I really liked it and look forward to more of it. I love the socks and now I'm a bit nervous about my 2 skeins of it. 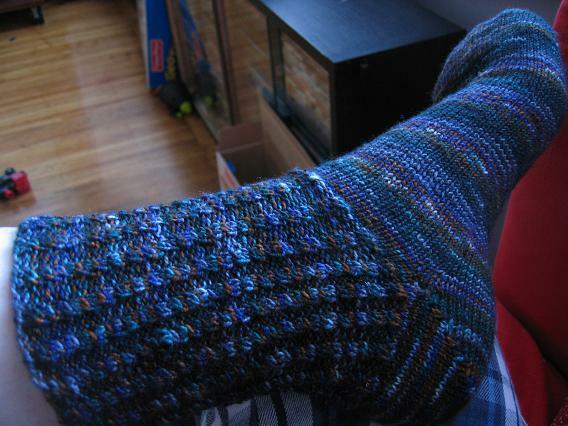 Your socks are beautiful and I love baby cable ribbing! Great socks, love the baby cable rib. You have inspired me to knit more than just simple, basic socks. 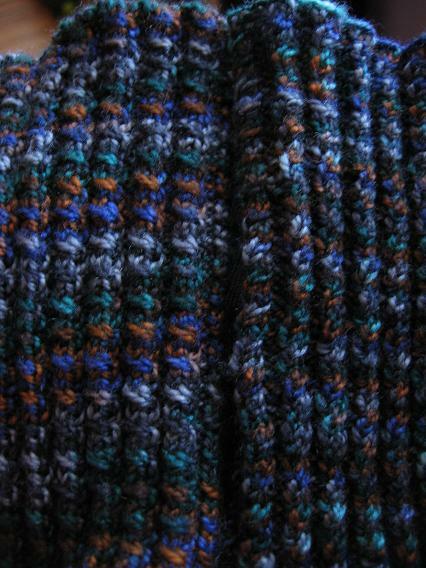 I love baby cable rib - I do that when I just want to do basic socks. Love the socks - great colors. The wire bracelet is gorgeous! What a beautiful pair of socks....and a great color. Such small needles; I am so impatient. Hey Aija, I found you from Anne who I found from Chris. I know another Aija! She has a sister Andra that I am friends with. A couple of years ago when the Berocco rep Andra Asars came by, I told her "I know an Andra" "You do not" "yes, I do" "It's a Latvian name" "yes, I know" "how can you have a friend named Andra" "my friend is Latvian" She was really pretty funny about it, almost offended that she's not the only Andra out there. Love all your socks! i love the mermaid bracelet! baby cable looks very handsome- looks like it will add warmth as well! Bracelet is gorgeous. Like the socks, but makes me wary about the skeins of Interlacements I just ordered. (First timer, but the colorway was just too tempting.) I'm currently doing a baby cable rib sock. It's so nice-looking!